Playing up to 100 concerts annually in major venues throughout Ireland and the UK- Declan, Ray, and Dominic promise you a night to remember! Their thrilling, fast-moving concerts boast set lists that are packed with the world’s most magical and uplifting numbers. The Three Tenors Ireland have been the headline act in such prestigious venues as the National Concert Hall in Dublin, Cork Opera House, Killarney INEC and Christ Church Cathedral, Dublin and Glin, Co. Limerick. With their superb voices and friendly down-to-earth approach, combined with an eclectic mix of songs from Pavarotti to The Dubliners, this talented trio never disappoint. 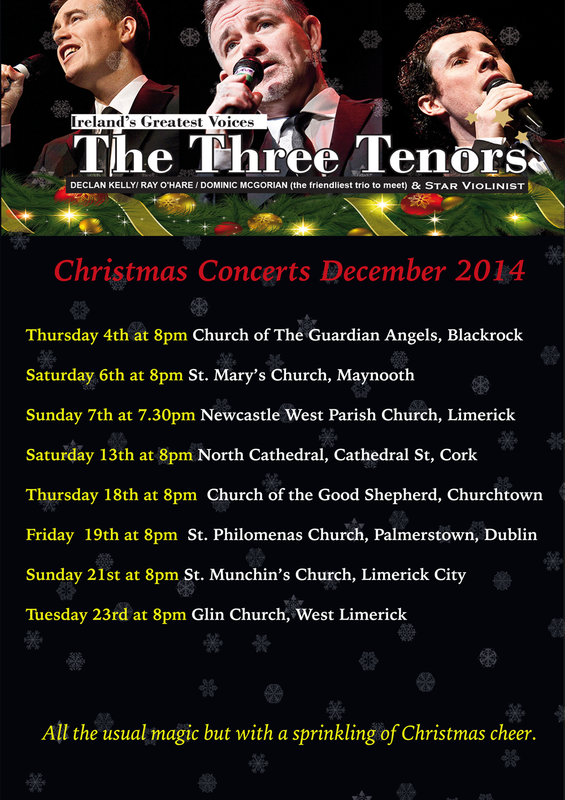 Why not spend a night in the company of The Three Tenors Ireland- a fabulous evening of entertainment is guaranteed! This entry was posted in All Glin News..., Church & Parish, Glin Development Association. Bookmark the permalink.